Our school year has gotten off to an AMAZING start! (I can only hope our entire year goes so well!) I think the thing that is helping the most is my fabulous planner. I make my own in Excel; because our homeschooling schedule is not traditional (we school Thursday through Sunday), I started making my own a couple of years ago. Also included in my planner are tentative schedules for Casey and Will and my plan for history (SOTW 3 and "From Sea to Shining Sea"). So far, the hours I spend planning everything out are paying off! We started this school year on July 30. Casey is in third grade, Will is in first, Tricky is in PreK 3/4, and Chaucer is... well, he's everywhere. Chemistry is the science choice for the YEAR - a whole year on one subject, help me. We started off with an experiment - making ice cream. I remember making ice cream in my high school chemistry class using milk, salt, and a baby jar. The high school ice cream experiment was a flavorless (save for all the salt) disaster. Homeschool ice cream, on the other hand, was SOOOO very good (especially considering it was 97 degrees that day). Chemistry is brought to Gratia Plena Academia by Elemental Science. History has been fun, too! We're using Story of the World 3 and From Sea to Shining Sea - along with 10 weeks of the American Revolution for Kids - for the spines. I also have a TON for independent reading for Casey (and a few for Will, too). This weekend we're discussing King James I, Guy Fawkes, Jamestown, Pocahontas, and John Smith. I've planned some great field trips this year - hopefully we'll even make it to Jamestown, Williamsburg, and Roanoke Island before this school year is over! Will was initially very excited about all of his school books - he has a significantly higher number of workbooks for first grade than he did last year. Notice, I said "was... excited." Reality set in quickly - he now realizes with all those new workbooks comes more work! Tricky is excited to be working along side her brother and sister - but also enjoying the freedom she has to go play after working for a short while. 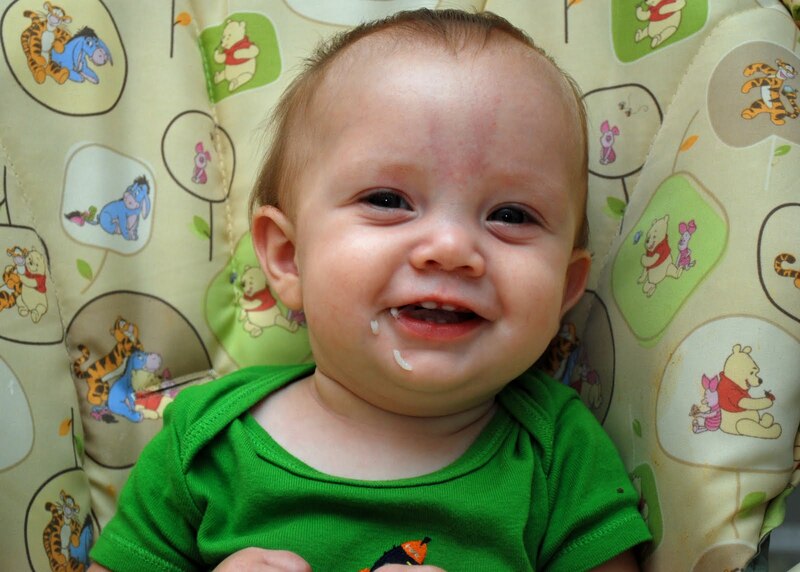 Chaucer is (as I said before) everywhere - crawling, standing, grabbing, squealing, eating, and playing. I love it! As for extracurriculars, Casey and Will are both taking piano, voice lessons, and karate. Fun! It sounds like you are definitely off to a great start! We had a great time when we went to Jamestown & Williamsburg. The recreation of Jamestown is superb - one of the best "living history" type places I've ever been. The archaeological work at the original site is pretty fascinating, too. Sounds great!!! We're going to make ice cream later this year ... so glad to hear yours turned out so yummy!! Oh, I can't wait for a chance to take my kiddies to Williamsburg, etc. I've never been, either, so it will be a real treat. Of course, we're just in SOTW 1 now, so it will be a while. . .
LOL. 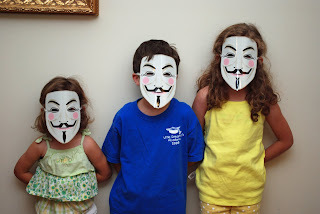 My son LOVED the masks. We are studying chemistry right now also. I'm thinking homemade ice cream sounds perfect. We had 110 degree temps yesterday. 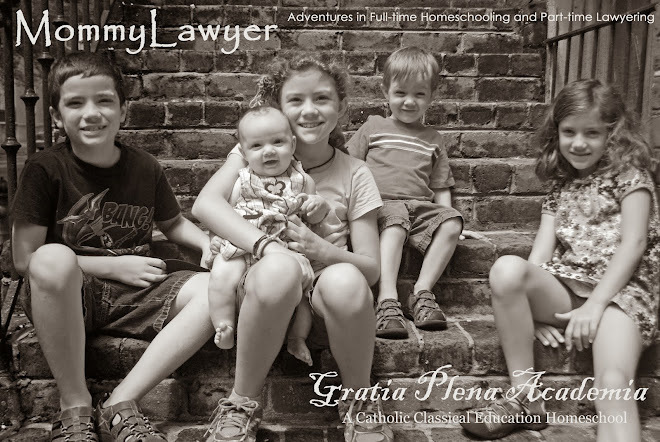 Of course homeschool ice-cream would be better! ;) Looks like a great week. You have a beautiful family. We would have joined you for that ices cream... and we're not even studying chemistry. Sounds like you had a great week. 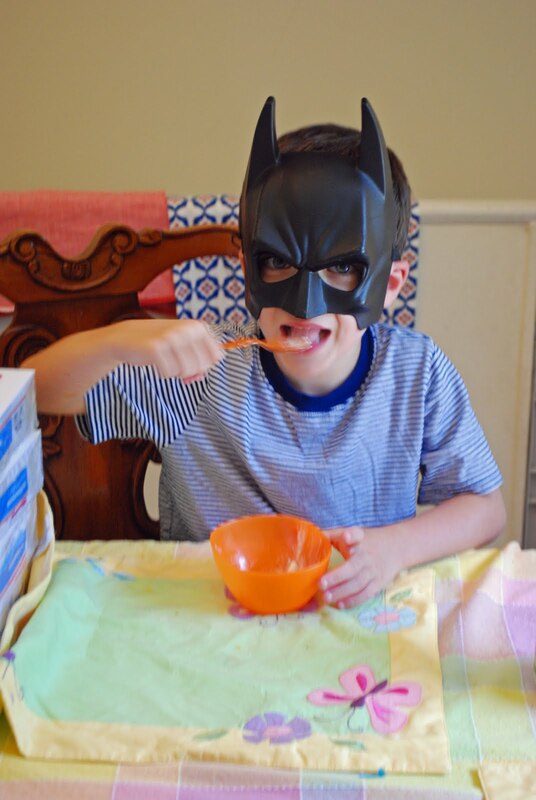 My boys love the idea of eating breakfast in a batman mask. I love homemade icecream! Did you try the jar-rolling method, were you have the ice cream in a baggie inside a jar of ice and rock salt? Your post makes me long for the days when mine were all young and everything was so much fun...sniff sniff...enjoy those sweet kids, especially the contrarian! My first grader suddenly realized 1st grade is different than K too! He's slowly getting used to all of it. You are studying some fun things! I'll stay tuned to your SOTW3... we'll start that about mid-year... and we'll do Chemistry (Elemental Science too) next year... my kids will LOVE making the ice cream! Thanks for sharing your week! Sounds like you have a great (fun) year planned!!!!!!!! This was our first week back. My main goal this year is to get started early, so we can finish early...or at least on time. I also make my own plans. I have never been the kind of person that is able to take someone else's idea and make it work. I have to see it for myself and go with it. It has work for us for five years...we are starting our sixth year. That's so hard to believe. I hope your school year continues to go well! Angela, I just saw your comment about performing at Ms. Lilly's on my blog. Your children are such a delight. I love watching them sing and admire their stage presence. I think it says a lot about their upbringing. Singing is a wonderful thing and I highly encourage it to everyone, no matter the age group! Hope to see you again soon.